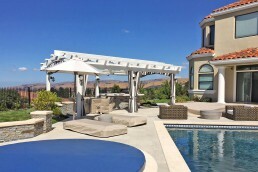 Sitting atop the modern wave of innovation known as Silicon Valley, where the world’s most brilliant minds rapidly change the course of history by rewriting the future, sits this peacefully private refuge of tranquillity and relaxation. 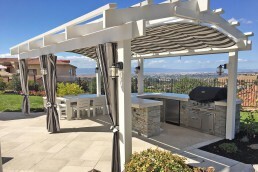 This private residence, designed and developed by San Jose’s own Northwolf Group, is the perfect escape for the modern worker. 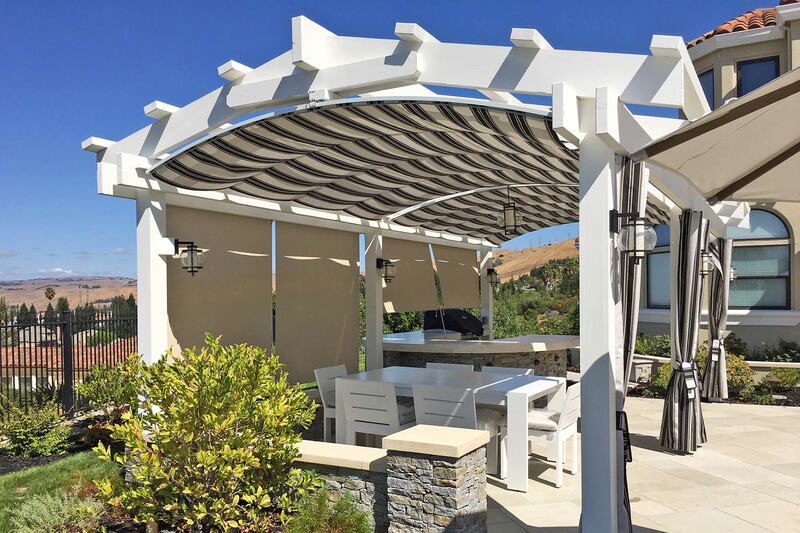 Overlooking the oft-golden brown Santa Clara Mountains, this backyard oasis boasts luxurious amenities, including a beautifully arched white pergola with two ShadeFX motorized canopies and curtains. 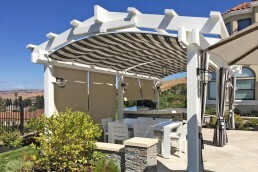 To ensure a seamless design between the pergola and the ShadeFX hardware, each piece is powder coated white, creating an undisturbed silhouette. 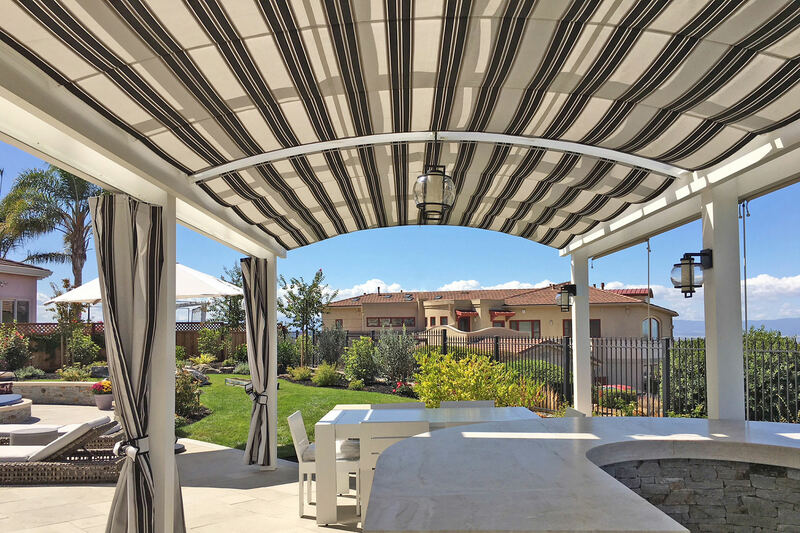 Though San Jose only experiences light rainfall throughout the year, this design ensures homeowners have a reprieve from the 300 sunny days enjoyed in California, otherwise aptly described as the Sunshine State. It’s because of this dual purpose and our innovative design that we have had the opportunity to work in San Jose California with the Northwolf Group on more than one occasion. 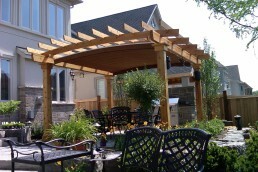 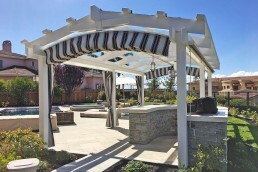 “We have worked with Shade FX on several design projects to create beautiful outdoor elements for our landscape projects. 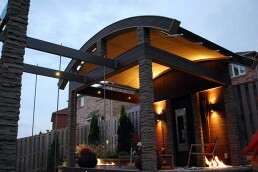 Each unique design comes with a set of challenges and yet working with Dave closely from concept through final production was smooth and easy. 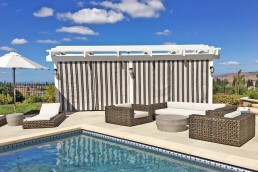 The collaboration – communication and turnaround was seamless making the development part of the process enjoyable leading to a smooth installation. This blossoming relationship is a constant challenge, as we constantly strive to exceed Silicon Valleys evolving innovation and style, where the future and city is always bright. 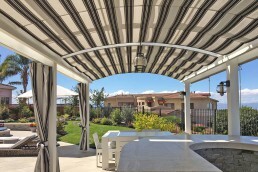 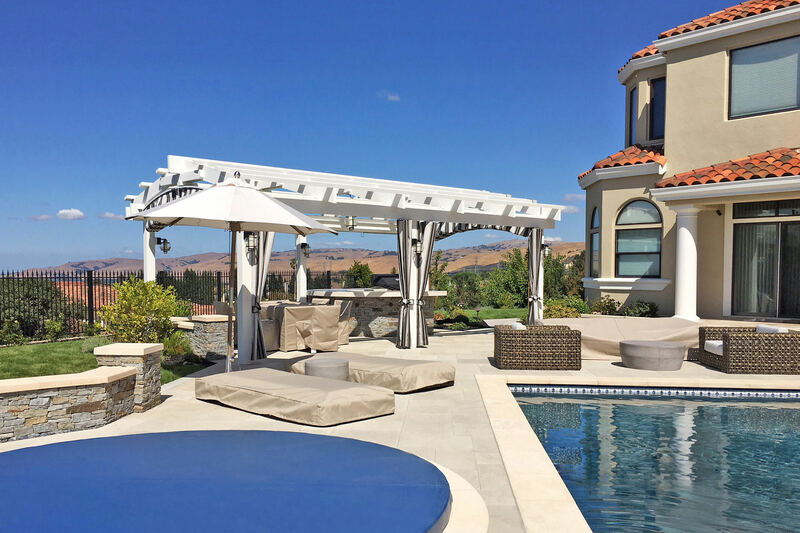 Overlooking the oft-golden brown Santa Clara Mountains, this backyard oasis boasts luxurious amenities, including a beautifully arched white pergola with two ShadeFX retractable shades.